Biomorph Viewer is an applet which generates biomorphs so as defined by Richard Dawkins in The Blind Watchmaker. It demonstrates the power of cumulative selection. Biomorph Viewer generates Biomorphs so as defined by R. Dawkins1 in "The Blind Watchmaker". Imagine you are taken to the moon. During your exploration, your foot runs up a stone. You obviously will consider it as a natural ever-existing object. A little bit further you find an unknown definitely geometrical object. It undoubtedly reveals a subtle and complex mechanism. You will immediately attribute it to a clever being who lost it there. According to Paley, believing that life on earth would be a natural phenomena is as absurd as thinking that the watch found on your way, or the complex mechanism found on the moon, spontaneously appeared without any intervention of a clever being. The complexity of life, and especially of human being, is the evidence of the existence of a Creator : life complexity originates in this form of intelligence. In 1859, Darwin showed in "The Origin of Species" that the complexity of life could be explained differently. The famous example of the eye will help us to understand these opposite conceptions. The iris - equivalent to the diaphragm of your camera - regulates the quantity of light received. The lens (biconvex) adjusts the focal distance. 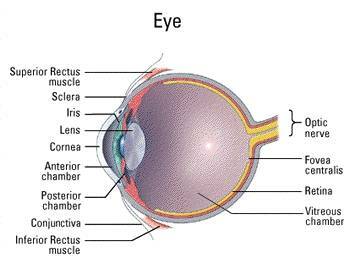 The retina - which is the film - contains about 125 millions of photosensitive cells (compare that value to your digital camera resolution). Due to the correct operation of both previous organs it receives a perfect image, pre-treats it and sends the information to the brain for final interpretation. Such a system only can work when achieved. The malfunction of one of the components implies imperfect sight, either an unidentifiable image or no image at all. In this context, it is hard to explain the apparition of the eye on an evolutionist point of view. Since the system only works when achieved, and since the evolution always proceeds through micro-mutations2, how to imagine a complete chain conferring a strictly increasing evolutive advantage, starting from no sight at all and leading to the modern eye ? According to those who believe in alternative theories, this chain merely does not exist : it is impossible to consider the simultaneous evolution of each component of the eye, always respecting a growing evolutive advantage. For Darwin, who examined the example of the eye in the Chapter dealing with the difficulties of his theory, this chain must exist, even if the fossil archives do not permit its reconstitution3. Dawkins has always fought for evolution., for him this chain exists. Furthermore its main steps can be reconstituted. Dawkins first disproves the idea that an uncompleted eye is a useless object. For him "5% of an eye is better than no eye at all". Let's imagine the first organism endowed with photosensitive components. These components are really imperfect, it can only distinguish light variations. Nevertheless, they are sufficient to allow it - once, twice ... - to escape its predator ; now Natural Selection can work. If 5% of an eye confers an evolutive advantage, it should be possible to find modern organisms with an incomplete eye. That's what Dawkins demonstrates, many animals (mostly invertebrate) have eyes with only some of the components of the modern eye. Some unicellular have only a "photosensitive point", some mollusks have photosensitive cells, set in a basin which allow them to perceive the direction of the incoming light. Nautilus are famous because of their "empty eyes" : they have nearly all the components of the modern eye, but no lens ; they look like a pocket in which the water circulates4. So, for Dawkins a complete chain of micro-mutations exists, from no eye, up to the modern organ. This chain can be interpreted as a continuous function : it is always possible to consider a series of mutations - smaller and smaller - to get from a point to any other. - It is difficult to consider a chain of "always smaller" mutations, where each of them systematically confers an evolutive advantage sufficient to allow Natural Selection to work. If with 5% of an eye, an organism can see the direction of the light, when 2% only allow light perception, we can accept that this advantage is sufficient to be transmitted, but what about the 6th % ? Is the difference really sufficient to be transmitted ? And, reasoning with Dawkins, what about the transition from 6% to 6.01% ? - There are some cases where these transitions are impossible. With Denton5, we can speak about viral capsides whose shapes are easily explained by laws of physics. The problem is that no intermediate shape is possible : they are not stable. We can also speak, for example, of birds respiratory system6 where the air always go in the same direction (for the others animals, it goes forward and backward). The bird's respiratory system is complex, it needs the perfect co-functioning of many devices. Considering that any small abnormal operation of the respiratory system can be lethal, how to describe a complete chain from the usual system up to the bird's system ? These comments are founded. They show us that Evolution theory, nowadays, is incomplete. Nevertheless it is, by far, the most fertile, and probably the closest to the historical reality, of the theories proposed to explain life complexity. The third chapter of the blind watchmaker is dedicated to the biomorph program developed by Dawkins that points out the power of micro-mutations and cumulative selection. The use of biomorph is very simple. The eye of the user plays the role of natural selection. Starting from a given form, the user will systematically select the biomorph whose resemblance -very subtle at the beginning - is closer to the wanted form. After a certain number of generations, the result will draw near to the aim. Biomorph Viewer so allows you to go through the genetic space (in this case a nine dimensions hypercube) so as to find the genome that best fits in the wanted form. Dawkins' genetic space included about 500 billion combinations. Through the game of cumulative selection, he tended to point out the opportunity of quickly discovering the desired genome inside this 9 dimensions space. The notion of cumulative selection is easy to understand. Imagine you want to find out the 4 digits code of a credit card. Starting from zero, you've got one chance over 10 000 to find out the code straight off. At the second go, one chance over 9 999 will be remaining, etc..
Let's now imagine each time one of the four numbers is correct, the dealer will utter a different sound to warn you. A maximum of 10 attempts will be necessary for each number. After 40 attempts you are sure to get the code. In the second case, the space you'll have to go through is considerably reduced. It is the same for the cumulative selection. For each new iteration, the biomorph closest to the wanted form will be selected. A similar way leads from the first biologic photosensitive component to the modern eye. For each new generation, the most efficient structure (i.e. the closest to the modern eye) will be selected. There is therefore no need to point out how hazardous is the spontaneous emergence of a complete eye : we are not looking for the complete code, we are progressively selecting each of its components. 0- Since I'm French, my English is far to be perfect. Please be patient. And Thanks to Marie for translation help. 1- R. Dawkins, The Blind Watchmaker, Penguin Books, 1990. Original edition 1986. 2- It now appears that some kinds of macro-mutations are possible. If confirmed, it could be a revolution in evolution interpretation. See : Chaline J., Les Horloges du vivant. Un nouveau stade dans la théorie de l'évolution ?, Hachette, 1999. 3- Darwin C.R., The Origin of Species, Wordsworth Editions 1998. 4- Dawkins admit that the absence of lens is a problem. Why has the nautilus not found such a common organ ? 5- M. Denton, Nature's Destiny, The Free Press, 1998. 6- M. Denton, Evolution, A Theory in Crisis, Adler & Adler, 1996.